Use AceText as a temporary storage pad during complex text editing tasks. Never again lose an important chunk of your document because you copied something to the Windows clipboard, deleting the text you copied a minute ago which you forgot to paste first. AceText keeps everything you copy to the clipboard in its clipboard history, transparently extending the Windows clipboard. Use AcePaste to quickly select and paste any text clipping from the ClipHistory. Save time by moving blocks of text out of your document, into AceText. This eliminates clutter from your document, without deleting text you may want to reuse later. 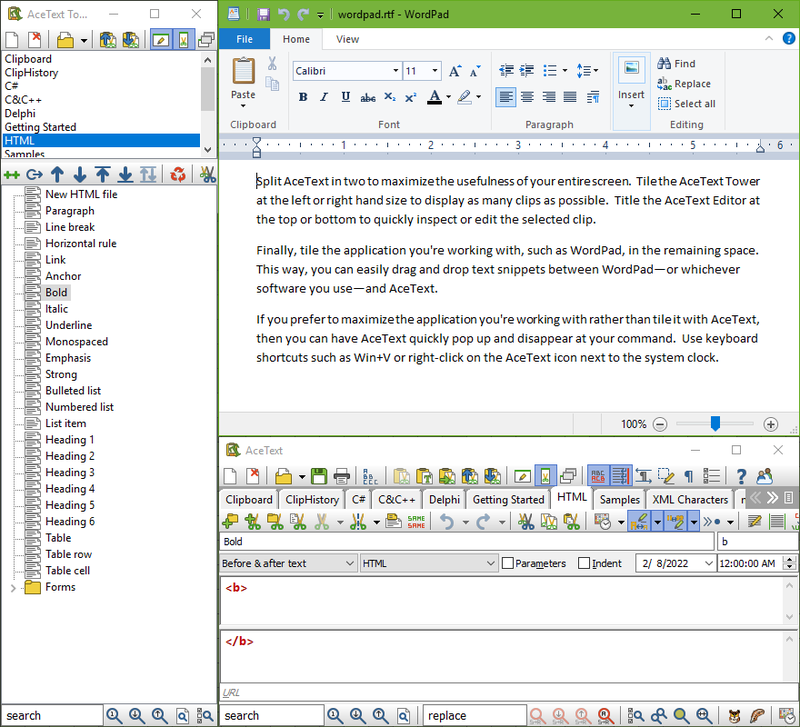 If your computer has a large monitor, you can split AceText into the AceText Tower and AceText Editor, and tile them on the screen with the word processor or other application you're working with. Then you can easily move text about between AceText and the other software with copy and paste or drag and drop. Store text as a new clip in AceText, or insert it in the middle of another clip. AceText has a full-featured text editor built-in, enabling you to conveniently prepare or edit snippets before adding them to your document. Clean up text automatically, such as removing email quotation marks, converting character case, or trimming whitespace. "I purchased AceText along with EditPad Pro last year. First, I LOVE the two programs. They save me a ton of time when I’m programming the same repetitive same repetitive stuff over and over again."